Did a bit if exploring, going up a side road by the Slate Canyon parking lot. Actually I have tried going up here before, but I think I followed the path a bit longer than in the past. Still haven't found a rideable way down from here. Today's ride was just too much fun. 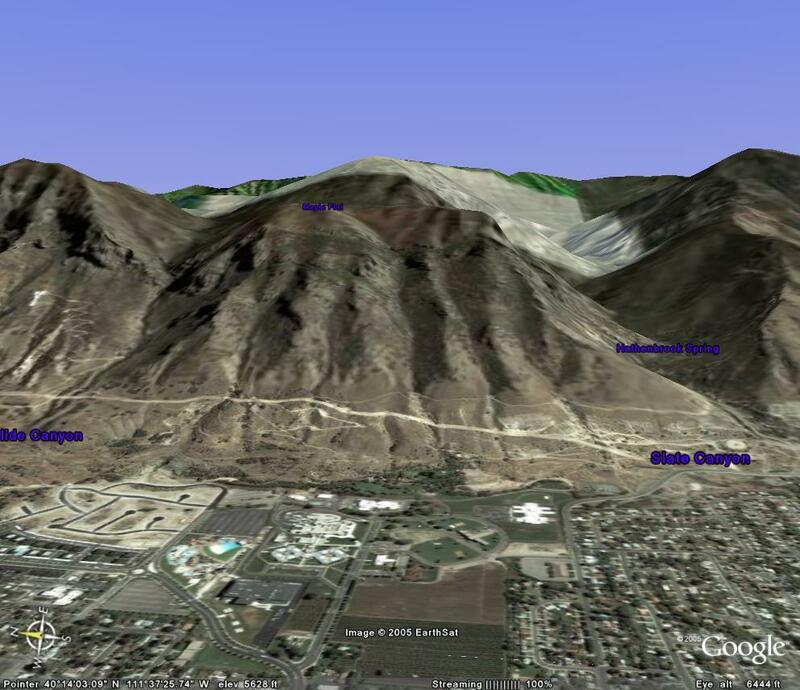 We just went up Slate Canyon to the pipe hill and did some work on the trail but it was so much fun. The weather is just perfect so I decided I'm not going to ride the road bike to work this week so that I can have more fun mountain biking. 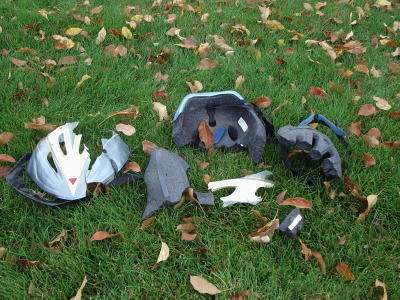 Today's picture is of the helmet I cracked up a month or more ago. I was headed down a hill that turns from being steep down to steep up. Unfortunately I was going a bit fast, and my back tire got caught in the washed out rut down the middle and I lost control. I could tell I was going to hit the up side of the hill hard. The first thing that came to my mind as I lay in a pool of blood was "I broke my nose!" 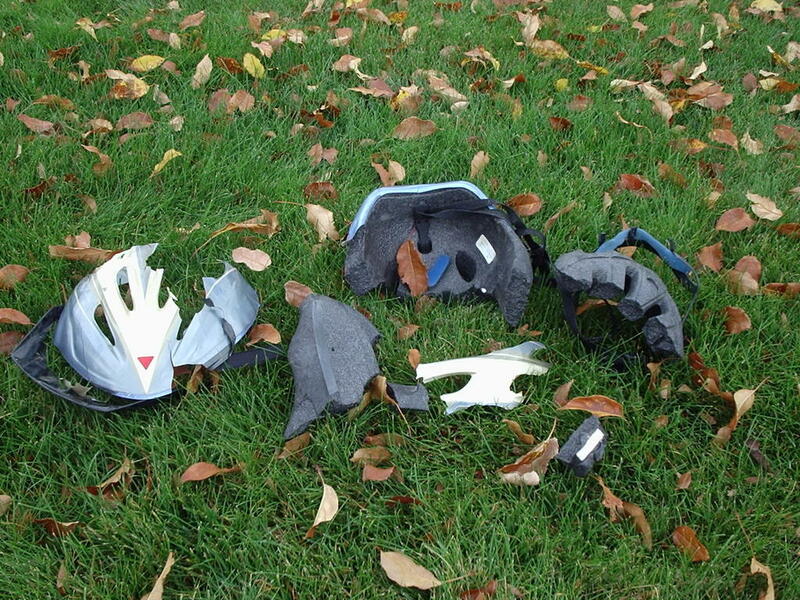 I getting up my helmet was broken into a dozen pieces. I obviously had hit a rock with the front right on my helmet. I gathered up the pieces and walked the rest of the way back to the road. Somewhere along the way I must have dropped a few pieces because they are not all here. Anyway I learned a few lessons from this crash. 1) If Juan suggest we take the safer route down the mountain... listen. 2) Neosporin is a wonder drug. My nose was a big mess, but in an amazingly short amount of time it healed up with only a small scar that is hard to see. I still have a hard time believing how well it worked. 3)I had a third lesson, which was the best one but I forgot what it was. So for my third lesson: The best lessons are soon forgotten. I rode the alpine loop today. This is one of the most popular road bike rides in the area. However, I started from my house in Eagle Mountain which made this a 70+ mile trip. I sure was glad I had a triple, I don't think I could have done this on a double. 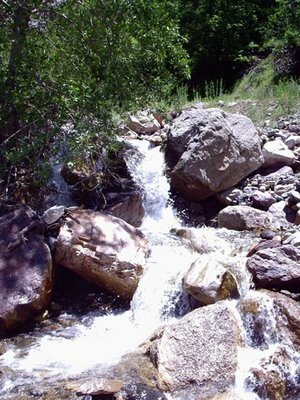 I only stopped twice, once at the top of the loop, and once at the mouth of Provo canyon. At each place I stopped long enough to eat an apple and candy bar and then continued on. I had noticed that I was only about 80 miles and 4,000 feet behind Brady for the fall challenge on activebody.org. 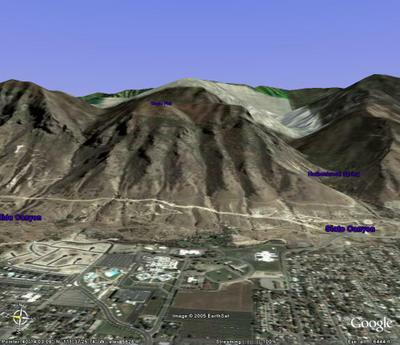 I planned on also going up Squaw Peak, which I figured would put me ahead. 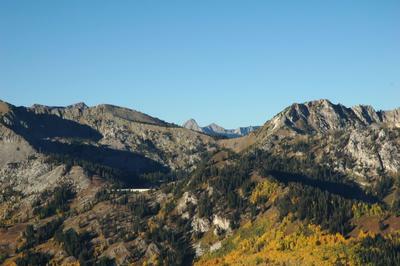 However when I got to the turn off for Squaw Peak I just did feel like climbing it. So, I'm now ahead in feet but not in miles. However when Brady gets back in town I'm sure he'll start riding again and pass me back up. The ride was about as nice as it can get. Nice fall temperature, and the leaves just past the summit were beautiful. It was almost like a mountain bike trip with the leaves on the ground on both sides of the trail, except this time it was a narrow road. When I got down past Sundance my speeds were approaching 40 mph. With the narrow road and turns I just didn't feel comfortable at those speeds so I was sitting up right as much as possible to catch as much wind as I could and still had to brake a lot to keep the speed below 40. On the way into work this morning my front tube exploded. Mike thought it was a car back firing. We put in a new tube, thinking it must have been a poor quality tube. Then as Mike pumped up the tire it exploded again spraying us in the face with dirt and debris. Still not understanding what was wrong we put a new tube in and only pumped it up to 90 psi. Then just before we put the wheel back on the bike, Russ caught up with us and noticed that the tube was sticking out a hole in the side wall. Turns out the brake pad was a bit high and was rubbing against the tire every time I used the brakes. Anyway I went back to Mad Dog where I bought the bike and complained that they set it up with the brakes rubbing the tires. They were nice enough to allow me to get a new replacement tire or a credit towards the tire if I wanted to upgrade. So now I am running on new Bontrager Race Lite Hardcase tires. They a bit heavier but are suppose to be puncture resistant. We will see how they work. Every ride is a good ride. It is nice and warm for this time of the year. Today's ride was just about the perfect weather/temp. The gate at Slate Canyon is still open so again we tried to make it up the hill past the gate without stopping at the gate. Juan and Layne made it, but I failed once again. Fall in Utah is a beautiful time to be mountain biking. This is a picture Layne took on the Guardsman pass to Mill Canyon trail. Well, it's been a long time since I last blogged a ride. It is not that I haven't been riding, but because my server that hosts my pictures has been down. I was hoping to replace it with new hardware but I'm not sure if that will happen given how long it has been since I requested the hardware. The gate at the mouth of Slate Canyon has been open the last couple of times. I'm not sure if this is a good thing or bad. It use to be that I was trying to make it up the hill past the gate after having to stop and go around the gate. Now we have been trying to make it up the whole way from the parking lot. Today I almost made it. After going around the corner past the gate and starting up the worst part of the hill, I started to loose my balance and shoved off a big rock with my left had twice. I made it a few bike lengths further and then finally succumbed to the slope. I have been biking in to work from American Fork a lot lately. This is nice as it gives me over 30 miles of riding each time, but it is also bad because it cuts into my mountain biking. I did try riding the rode bike into work, then riding the mountain bike for lunch, and the riding back to AF, but doing that much three times a week plus the normal rides was really wearing my legs out, so I had to quit.